This week I have another great batch of Original British Quad Posters from the 1950’s through to the 80’s. Headlining the auction this week is a highly collectable poster for the 1961 Sci-Fi Adventure “MYSTERIOUS ISLAND” a great investment piece for any collector of the genre, Also from the same year I have “ATLANTIS, THE LOST CONTINENT” featuring some striking black and white artwork. From the 1950’s I have an early Steve McQueen title “NEVER LOVE A STRANGERr” which stars John Drew Barrymore and Lita Milan. Also from the 50’s I have the comedy “A PRIVATE’S AFFAIR” featuring Sal Mineo, and “THE NAKED HILLS” from 1956 starring Keenan Wynn. 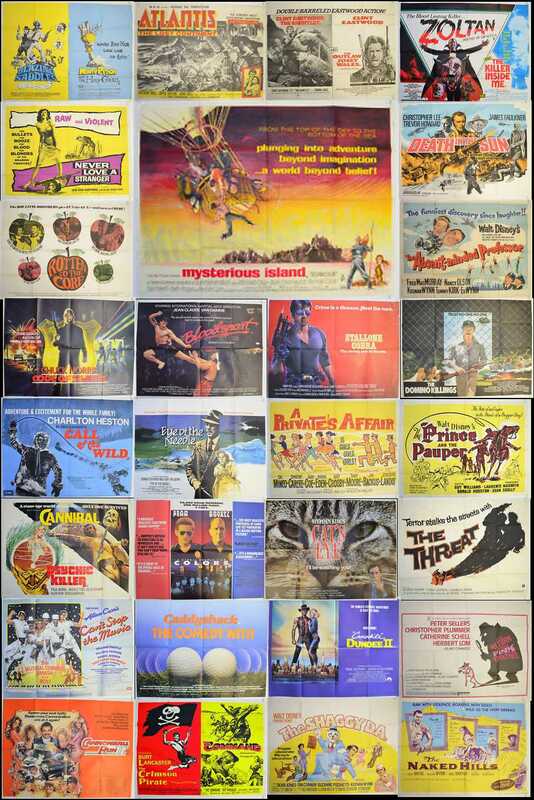 More offering from the 1960’s include British comedy “ROTTEN TO THE CORE” starring Anton Rogers and Eric Sykes, Walt Disney titles “THE ABSENT MINDED PROFESSOR” and “THE PRINCE AND THE PAUPER”, plus the Charles R. Rondeau Thriller “THE THREAT”. Another Tom Chantrell poster heads up the 70’s “DEATH IN THE SUN” starring Christopher Lee and Trevor Howard, plus a couple of great Double Bills including a Clint Eastwood double for “THE GAUNTLET / THE OUTLAW JOSEY WALES” and a Comedy double of “BLAZING SADDLES / MONTY PYTHON AND THE HOLY GRAIL”. Also from the 70’s I have Charlton Heston in “CALL OF THE WILD”, Gene Hackman in “THE DOMINO KILLINGS” and a Horror double bills “ZOLTAN... HOUND OF DRACULA / THE KILLER INSIDE ME” and “CANNIBAL / PSYCHIC KILLER”. Some great action movies from the 1980’s include “BLOODSPORT” Jean-Claude Van Damme, “CODE OF SILENCE” Chuck Norris, “COLORS” Sean Penn and Robert Duvall, plus “COBRA” Sylvester Stallone. Plus 80’s comedies “CADDYSHACK”, “CROCODILE DUNDEE” and “THE CANNONBLL RUN II”. One last poster worthy of note is “EYE OF THE NEEDLE” (1981) which features stunning artwork by Vic Fair ..take a second look at the cliff face! There are nearly 50 titles and all are worth a couple of moments to browse through!